From tomorrow Sunday 9th December a new cafe will be opening on the upper deck alongside the shoe shop and Raw Energy. We RR’s have been politely asked to refrain from leaving our cycles in this area while we undergo necessary post ride caffeine recovery activity. I have asked Raw Energy if they could re-instate their old (green) cycle rack down on the side-way by the road but clear of the footpath. This may or may not always happen so RR’s are further asked not to crowd or hinder this path for pedestrians. The situation will be monitored over the next few months and if necessary the council may be contacted to provide some REAL! cycle racks. Watch this space. Opportunity is taken to wish all Raw Riders and their families a happy, safe and enjoyable Christmas period. Girraween Sports Complaex – Grand Opening, Last Friday was the Grand Opening of the sports complex, including the cycling track which was demostrated in style. A mini race/demonstration had around 30 cyclist show up with another 20 students from the local school riding around. The track was lined with school children cheering on the riders. The race turn serious half way through with 4 very good riders getting away and sprinting out the finish. Note: the club is looking to run an extra grade but this will be decide depending on the number of riders on the day. The club handicapper will be on hand to reward riders for past performances. Club results from the weekend. Club is having a meeting this Thurs to discuss a draft calendar of races for next year. If you have a suggestion please send your suggestion to me to be discussed. 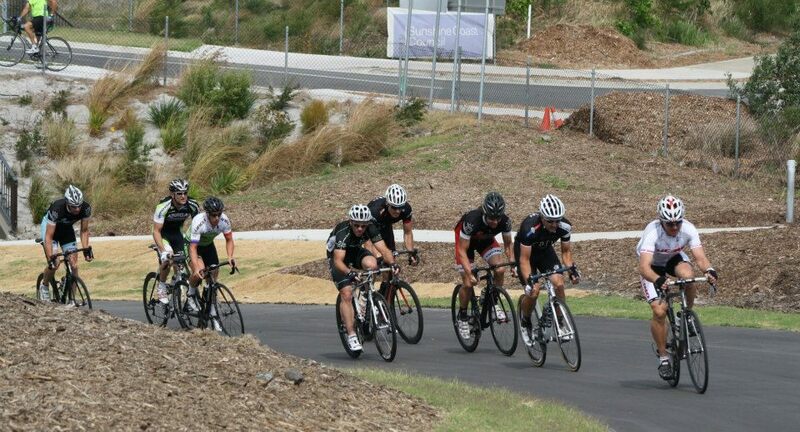 We would just like to thank you all for coming this morning to the opening of the Girraween Sports Complex and if you took part in the race – awesome work on the criterium track in pretty warm conditions. We had a lot of great feedback about how exciting it was and well done to the three Ben’s for winning it. Maybe we can make it part of the Noosa Tri or winter series ?? I know it was a busy day with media commitments for some of you so thank you again for taking the time get here this morning. Remember if you have any questions regarding booking the track please give me a call or shoot me an email.